In this paper, first, we present our simulation studies that help to outline key factors for a proper available-bandwidth-based flow admission control in ad-hoc Wireless Sensor Networks (WSNs). In most cases, WSNs use the IEEE 802.15.4 standard, therefore our simulation studies are based on the same standard. The identified key factors are: (i) the overheads (back-off, retransmission, contention window, ACK packet, and ACK waiting time) associated with the unslotted IEEE 802.15.4 Carrier Sense Multiple Access Collision Avoidance (CSMA-CA) MAC layer protocol reduce the amount of available bandwidth, (ii) the impact of the MAC layer overheads on a node’s available bandwidth is a function of the number of active transmitters and data traffic load within the interference range of the node, (iii) contention count on a node that is not on a flow’s data forwarding path is a function of the number of active transmitters (along the flow’s data forwarding path) within the interference range of the node, and (iv) a flow’s intra-flow contention count on a node (along the flow’s data forwarding path) depends on the hop-count distance of the node from the source and the destination nodes, and the node’s interference range. Second, we present a survey of state-of-the-art flow admission control algorithms for ad-hoc wireless networks. The survey demonstrates that the state-of-the-art flow admission control algorithms do not completely consider the key identified factors or make incorrect assumptions about them. Third, we propose techniques that an available-bandwidth-based flow admission control algorithm can use to incorporate the key identified factors. 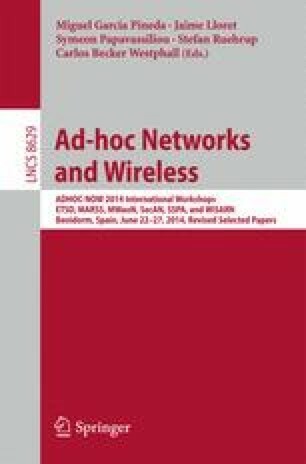 Hence, the work presented in this paper can serve as a basis of a more effective available-bandwidth-based flow admission control algorithm for ad-hoc wireless networks.